The present article will explore how the collapse of the pharyngeal airway during sleep, a phenomenon currently identified as an indicator of disease, may confer specific homeostatic benefits. More specifically, we will consider how the pathologically large size of the fleshy structures in the pharyngeal airway, along with relative hypotonicity of the pharyngeal musculature may have provided our ancestors with a selective advantage by enabling them to reduce nocturnal, respiratory heat loss. When the pharynx is collapsed, the diameter of the pharyngeal airway decreases, allowing increased intermolecular collisions between inspired air and the epithelial walls of the upper airway. An increase in the number of collisions should facilitate the transference of both warmth and humidity to inspired air before it reaches the more sensitive lower airway resulting in the maintenance of internal, core temperature and increased alveolar heat retention. By inducing increased muscular activity in the diaphragm and by mechanically stimulating specific pharyngeal structures, pharyngeal collapse might provide other homeostatic benefits as well. In light of the debilitating disorders associated with pharyngeal collapse, the absence of a disease state secondary to surgical correction, the high proclivity for collapse documented in pregnant mothers, and the functional similarities between collapse and reflex bronchoconstriction, it appears that the phenomenon is explicable under evolutionary medicinal theory. The collapse of the pharyngeal airway, a physiological occurrence that accompanies sleep, is known to affect all people. The degree of collapse experienced by an individual is determined by his or her genetic vulnerability and can be placed along a spectrum from healthy breathing to apnea and disease. In susceptible individuals, pharyngeal collapse presents as obstructive sleep apnea syndrome (OSAS) and upper airway resistance syndrome (UARS), two widely prevalent and relatively pernicious disorders. Figure 1. 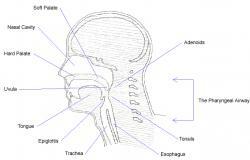 Sagittal diagram of the head and neck depicting relevant structures of the upper airway. Using a paradigm constructed by Williams and Nesse (1991), this article will attempt to analyze pharyngeal collapse using evolutionary medicinal theory. In order to show that a trait may be a form of evolutionary medicine, it is necessary, under this framework, to provide evidence that the trait is relatively prevalent, that it is heritable, and that susceptibility varies within populations. It is also necessary to show how the genes responsible for the trait might have been naturally selected. For example, many heritable traits involve a trade-off or compromise and when analyzing these traits, it is necessary to provide evidence showing that the decrement in reproductive success due to associated health risks can be mitigated by associated health benefits (Williams and Nesse 1991). Williams and Nesse have identified many such "pathological" conditions such as anxiety, cough, diarrhea, fever, inflammation, pain, sneezing and vomiting and have helped to show that they are actually evolved defenses (1998). This article will examine how pharyngeal collapse might create a net fitness advantage by playing a passive but significant role in the maintenance of nocturnal homeostasis. Today, the costs of collapse are well documented but the defensive manifestations may be hidden because of compensatory aspects of our modern environment (ie. insulation and central heating). Providing an evolutionary explanation for susceptibility to collapse may help explain the high prevalence in human populations and may inform both medical and gene therapy. Before we consider the ultimate or evolutionary cause of pharyngeal collapse we must first look at the proximate, pathophysiological causes. Because the present hypothesis is in part predicated on pathophysiological data, the provision of background information describing the etiology, symptoms, and methods of intervention is in order. The discussion of etiology motivates us to focus on two causal factors, namely the collapse caused by hypotonia (relaxation) in pharyngeal musculature and the obstruction caused by specific structures within the pharynx. Pharyngeal collapse arises when the airway that allows easy and normal breathing becomes blocked. When a person is awake pharyngeal dilator muscles maintain a clearly defined, open pathway to the lungs. These muscles disallow specific, membranous structures within the airway from interfering with inhalation. When a person is asleep, however, these muscles become hypotonic; they relax and may tend to collapse (Horner 1996). It is well accepted that the nocturnal collapse of pharyngeal musculature is responsible for both the increase in the degree of obstruction caused by specific pharyngeal structures, and the restriction of the flow of air through the upper and pharyngeal airways (Horner et al. 1994; Wheatley et al. 1993). Snoring is the sound associated with severe pharyngeal obstruction and occurs when certain structures within the pharyngeal airway vibrate excessively as air is pulled through the narrow opening toward the lungs. Any of the membranous structures that lack cartilaginous support, including the uvula, adenoids, soft palate, pharyngeal walls, and tonsillar pillars are predisposed to vibration (Crumley et al. 1987). The soft palate (the upper surface of the mouth that separates the oral and nasal cavities) and the uvula (the small piece of soft tissue that hangs from the soft palate) are relatively large and fleshy and can obstruct the upper airway completely. When these structures obstruct the upper airway for even a short period of time, discomfort or morbidity may result. The complications associated with pharyngeal collapse are numerous and vary in severity. A review of these complications allows insight into how such a potent dysfunction might have seriously jeopardized the evolutionary fitness of our ancestors. Repetitive and severe obstruction of the pharyngeal airway results in the upper airway resistance syndrome (UARS), a form of sleep disordered breathing in which resistance to airflow leads to brief arousals from sleep thereby causing daytime somnolence (weariness) (Zielinski et al. 1999). Many UARS sufferers experience episodes of severe obstruction lasting from a few seconds to a full minute. These episodes take two forms: hypopnea (periods of reduced breathing) and apnea (cessation of breathing). Obstructive sleep apnea syndrome (OSAS), a related disorder, often results in the loss of oxygen, which can create serious disturbances in health. The cessation of breathing caused by obstruction can induce hypoxemia, a state defined by insufficient oxygen in the blood (oxyhemoglobin desaturation). It has been estimated that 24% of men between the ages of 30 and 60 suffer from apnea induced hypoxemia (Young et al. 1997). Painful cluster headaches precipitated by hypoxemia are also strongly associated with OSAS (Kudrow and Kudrow 1990, 1993). Prolonged hypoxemia often results in hypoxia, a deficiency in the amount of oxygen reaching body tissues. Hypoxia induced by OSAS is known to cause tissue damage in various regions of the body (Jennum et al. 1993) including the brain. It has been suggested that hypoxia caused by OSAS is linked with hypertension (Young et al. 1997), heart disease (Lugaresi et al. 1980), cerebrovascular disease (Neau et al. 1995), and various other cardiovascular diseases (Lavie et al. 2001). Recognition of the dangers associated with OSAS within the literature is a cause of increasing public interest and concern (Shin et al. 2003). An analysis of the methods of medical intervention reveals that the causal pharyngeal structures can be reduced surgically with virtually no negative consequences. There are several methods of intervention aimed at mitigating pharyngeal obstruction ranging from oral devices to surgery. The most successful way to stop habitual snoring is the surgical removal of portions of the soft palate (Krespi et al. 1994). Doctors that practice head and neck surgery, otolaryngology, perform such operations not as a last resort, but as a relatively successful method of medical intervention (Utley et al. 1997). Such surgical procedures include uvulopalatopharyngoplasty (UPPP), Laser-Assisted Uvuloplasty (LAUP) and palatal reduction by radio frequency ablation (somnoplasty). Larger populations of patients must be analyzed before surgery can be recommended as the primary form of therapy. However, there are currently no persisting, negative complications associated with the surgical reduction of the soft palate (Powell et al. 1998). Because the reduction of the soft palate poses no threat to modern day patients, an evolutionary explanation for the wide prevalence of its excessive size should prove informative. Pharyngeal collapse is a phenomenon that affects all people and it can result in various disorders that are highly prevalent in human populations around the world. Studies have demonstrated that the prevalence of OSAS could vary between 3.2% and 12.1% in children (Corbo et al. 1989; Anuntaseree et al. 2001), and between 5% and 40% in adults (Bearpark et al. 1995; Cirignotta et al. 1989; Fitzpatrick et al. 1993; Redline et al. 1997). Also, elderly populations are at significantly higher risk than younger populations (Young et al. 1993). Snoring is also very common in the general population; 3545% of men and 1528% of women report that they snore habitually (Ohayon et al. 1997; Young et al. 1993). The elderly, adults, children, and even infants (Brouillette et al. 1982) experience pharyngeal collapse and the associated sequelae. The presence of collapse throughout the maturational timeline is indicative of its value as a protective mechanism. Like most inherited traits and protective adaptations, a person's proclivity for pharyngeal collapse is genetic (Davies et al. 1996; Silverberg et al. 1997). Many researchers consider it likely that inherited, familial factors such as upper airway structure and neural control of the upper airway muscles interact to produce relative proclivity for OSAS (Redline et al. 2002). Because environmental factors can vary greatly from area to area, the relative distribution of most protective traits is known to vary widely, even between members of the same species. As might be expected, a large amount of variance exists with regard to the severity of pharyngeal collapse within the human species. Wide ethnic variations (Redline et al. 1997) in the prevalence of habitual snoring might result from differences in definitions and methodology, but more importantly it may stem from differences in population genetics. In fact, both the incidence of habitual snoring and the number of studies describing OSAS appear to be far less prevalent in Asia (Gau et al. 1995; Hui et al. 1999). If the risks associated with pharyngeal collapse make it a potentially enervating and morbid activity, how then could it have become so ubiquitous? Why would the human body so dramatically decrease autonomic, muscular support to the throat during rest, and why would such large, fleshy structures exist in an area so vital to respiration and health? Despite the scarcity of related research, the present article will attempt to characterize pharyngeal collapse as a mechanism, much like other respiratory mechanisms, that promotes the maintenance of homeostasis by regulating respiratory heat retention. Collapse occurs exclusively during sleep - this may be a functional response to the cold exposure that accompanies sleep-related processes. There are at least two factors that expose diurnal, sleeping animals to the cold. When an animal is sleeping its skeletal muscles are quiescent, especially during deep sleep. A lack of muscular exertion is a common cause of reduction in internal temperature. Also, it is widely recognized that the temperature of night time air is relatively low compared to daytime air. This temperature difference exposes diurnal animals to the cold when they are the most vulnerable. For these two reasons diurnal animals are particularly susceptible to heat loss during sleep. The sleeping mammal's respiratory tract is a prime candidate for the cooling process because it contains many square inches of wet, soft tissue that is exposed to rapidly moving, dry air for many hours at a time (Eagan 1963). As each new breath of air is inhaled, water molecules evaporate from the throat and lungs as part of an endothermic process, and a potentially large amount of body heat can be lost (Ferrus et al. 1980). For example, dogs utilize the respiratory tract as their primary means of dissipating excessive heat (Iscoe et al. 1983). Humans are susceptible to substantial changes in external temperatures and will die if their core internal temperature drifts more than a few degrees above or below 37 &deg;C (Lloyd 1994). It is fortunate that humans, as homeothermic mammals, are thermoregulators. They utilize specific homeostatic mechanisms to minimize the heat lost to the external environment. Such mechanisms include vasoconstriction, concurrent heat exchange, metabolic regulation, and shivering. These methods of heat conservation focus on maintaining the core internal temperature at the expense of heat loss within the extremities. Heat loss arising from respiration therefore can be very potent because it conducts heat away from the lungs and thorax, the very centre of the body. If it is true that nocturnal sleeping processes are more susceptible to heat loss than diurnal, awake processes, and that pharyngeal collapse is a mechanism involved in minimizing the rate of heat exchange between the respiratory system and the surrounding environment, then the involvement of collapse as an exclusively nocturnal mechanism is quite appropriate. The respiratory airways both heat and humidify inspired air before it reaches the alveoli, the final destination in the respiratory tract (Millar et al. 1965). Researchers do not seem to have reached a consensus regarding the benefits of maintaining the temperature of the lower airways and alveoli, but they do seem to agree on its importance. McFadden reported that the inhalation of dry, cold air increases cardiovascular stress and decreases pulmonary function (1983). Furthermore, certain reflexive measures taken by the respiratory system when it is exposed to cold air have led researchers to believe that cold air is deleterious to respiratory health and functionality (McFadden 1983). The exposure of the airways to cold air is consistently accompanied by reflex bronchoconstriction, vasoconstriction and the release of histamines (Doyle et al. 1994; Geller et al. 1988). These responses are regarded as protective by researchers (O'Cain et al. 1980). Contact of the skin with cold air is well known to stimulate thermally sensitive receptors that produce reflexive bronchoconstriction (Doyle et al. 1994). The constriction of the passageways within the tracheo-bronchial tree (the branches leading to the alveoli) in response to cold air is a process that diminishes susceptibility to heat and humidity loss (O'Cain et al. 1980). In other words, the heat and humidity retention that are ascribed to the collapse of the pharyngeal airway has been previously ascribed to the collapse of the tracheo-bronchial tree; the two mechanisms are physically and functionally analogous. The benefits conferred by reflex bronchoconstricion can arise when the animal is both asleep and awake. Unlike reflex bronchoconstriction, pharyngeal collapse responds specifically to the heat loss associated with nocturnal processes. A careful, physical analysis shows that collapse should increase respiratory heat conservation by increasing the rate of molecular collisions within the pharyngeal airway. Pharyngeal collapse should help to warm inhaled air before it reaches the lungs by creating a "narrower tube" for air to travel through. This narrow tube should also provide other benefits including the retention of water vapor, and the filtration of inspired pathogens. It should seem conceivable that a broader airway should not prove to be as effective as a narrower airway in achieving these benefits. For clarification, let us turn to an academically popular, thermodynamic system that is structurally analogous to the collapsible, pharyngeal airway. Figure 2. In fixed time period, t, there will be many more collisions in the cylinder with the smaller diameter. From a physical perspective, a "narrowing airway" is a cylinder that exhibits a variance in the distance between its walls. The number of times that a gas molecule within such a cylinder will collide with the walls of its container is a function of the distance between the walls (Wark et al. 1999). As the walls draw nearer, the average distance that the molecules will travel before they collide with one of the walls decreases. In other words, a reduction in the distance between walls results in an increase in the number of collisions per time period (Serway 1990). The number of collisions is very important because it determines how much kinetic energy will be transferred from the walls to the air molecules by conduction (Serway 1990). Knowledge of the corollaries of this physical model allows us to conclude that a narrower airway will create more collisions between the cold air molecules and the warm epithelial tissues of the pharyngeal airway thereby increasing the temperature of inspired air before it reaches the alveoli. Considerable water loss takes place through exhalation (Ferrus et al. 1980), and by narrowing the airway, more water vapor should be conserved. As mentioned before, a decrease in the distance between pharyngeal walls produces more molecule-wall collisions. The kinetic theory of gasses predicts that as the number of collisions increases, phase equilibrium is approached (Gombosi 1994). Therefore, pharyngeal collapse should allow for the condensation of more vapor from exhaled air before it is expelled. This process will also contribute to warming since respiratory airway vapor retention by means of condensation is exothermic (Cole 1954; McFadden et al. 1982). As an individual snores, tissues of the tongue, the pharyngeal walls, the uvula and the tonsils collide rapidly and sometimes, quite powerfully (Deegan et al. 1995). The direct mechanical effect of pressure and movement caused by snoring should effectively stimulate local nerve receptors. When nerve receptors within a tissue are stimulated sufficiently they cause the blood vessels within the proximate tissues to dilate, increasing warmth and circulation in the surrounding area. Once stimulated by the process of snoring, nerve receptors along the upper airway will cause surrounding blood vessels to dilate, effectively increasing circulation. Increased blood flow to the pharynx should help to provide warmth to inhaled air and thus, to the alveoli as well. The obstruction of the pharyngeal airway can create relatively large amounts of negative intrathoracic pressure (Rollheim et al. 1999). This negative pressure creates resistance against the inhalation of air forcing the muscles involved in respiration to work harder in order to obtain the necessary amounts of oxygen (Henke et al. 1991). Increases in the work level and energy expenditure of these muscles should result in increased overall circulation and warmth. To understand the soft palate, the structure most significant in the process of pharyngeal obstruction, we should look to its phylogenetic origins. Researchers believe that upon divergence with reptiles, mammals developed the soft and hard palates. The palates are thought to separate the nasal cavity from the oral cavity, enabling mammals to breathe during food consumption (Thomason et al. 1986). A closer look into the divergence of the reptilian and mammalian classes may provide evidence for why pharyngeal collapse is exclusively present in mammals. For millions of years, reptiles were members of one of the most dominant classes on the earth and yet, they were and still are reliant on energy from their external environment to obtain the warmth necessary for physical activity. Around 180 million years ago, warm-blooded mammals began to diverge from their ectothermic reptilian ancestors. Mammals adapted a way to maintain a constant body temperature through biological processes, but this increased functionality came at a price. Mammals require more energy than do reptiles in order to remain active and they are more susceptible to relatively extreme temperatures. This increased susceptibility may have necessitated that mammals adopt a protective homeostatic mechanism, an explicitly exaptive enlargement of the soft palate. Mammals seem to be the only animals susceptible to nocturnal pharyngeal collapse and the preponderance of mammals affected by it is reflected within the literature. Collapse can affect dogs (Veasey 1999; Petrof et al. 1994), primates (Guthrie et al. 1980), seals (Milsom et al. 1996), mice (Nakamura et al. 2003), pigs (Lonergan 1998) and many other mammals as well. There is no documented evidence of the existence of either collapse or of conspicuously enlarged pharyngeal structures in reptiles. Unlike reptiles, mammals require prolonged periods of deep sleep defined by slow wave activity (SWA) and rapid eye movement (REM) (Siegel 1999). Insensitivity to decreasing body temperature during non-conscious deep sleep might have been another factor that caused mammals to be selected for more massive pharyngeal structures. Finally, it is well established that significant reductions in pharyngeal dilation accompany rapid-eye-movement (REM) sleep (Wiegand et al. 1991). It is well accepted that the sickness and vomiting associated with food poisoning act as part of an immuno-defence mechanism, protecting the human body from microbial infection. A research biologist by the name of Margie Prophet (1995) has proposed that the morning sickness experienced by pregnant mothers is also protective. Prophet was able to show that mothers that are less prone to morning sickness are also statistically more likely to have a miscarriage. She also gathered evidence to support the claim that drugs that reduce morning sickness may be associated with fetal abnormality. Because of her work, there is now a consensus among immunologists that the morning sickness displayed by pregnant mothers may well be an evolutionary adaptation that responds to the susceptibility of the fetus to food poisoning. It is well accepted that pharyngeal obstruction is more prevalent in pregnant women (Hastie et al. 1989; Lefcourt et al. 1996) and that pregnant women report frequent snoring more often than non-pregnant women (Loube et al. 1996). Interestingly, a large amount of data has shown that the increase in the incidence of OSAS in pregnant mothers is very slight (Brownell et al. 1986; Hertz et al. 1992), that pregnancy is not generally associated with the precipitation of OSAS in non-obese women (Maasilta et al. 2001) and that self reported somnolence does not seem to increase in pregnancy as might be expected (Brownell et al. 1986; Hertz el al. 1982). Furthermore, mothers that experienced obstructive sleep apnea during pregnancy did not seem to be at any significant risk for delivering infants with fetal compromise (Loube et al. 1996). At first these findings seem anomalous, but a closer look provides clarity. The mechanism for increased upper airway resistance in pregnancy is diffuse edema (the accumulation of fluid) within the pharynx (Holdcroft et al. 1977). This edema is very consistent in pregnant women (Schnider et al. 1977) as is the mechanism that mitigates it. Increased pharyngeal muscle tone, possibly caused by elevated levels of progesterone, is thought to be the predominant factor involved in helping pregnant women overcome apnea by compensating for pharyngeal edema (Popovic et al. 1995; Loube et al. 1996). Drawing conclusions similar to those drawn by Margie Prophet, it appears that pregnant mothers may have evolved a protective increase in pharyngeal obstruction and snoring, but also have evolved a way to compensate for the negative effect of obstruction, apnea. Even if sleep apnea were to result in depleted oxygen saturation in a sleeping mother, there is reason to believe that her fetus might remain relatively unharmed because of certain properties particular to fetal circulation and the fetal hemoglobin (Awe et al. 1979). The current article believes that like morning sickness, pharyngeal collapse is protective and an increase in the incidence and severity of collapse in pregnant mothers may allow them to better regulate homeostasis and better protect the fetus. We have sufficiently satisfied some of the criteria that Williams and Nesse suggest should be required for all cases of evolutionary medicine. For example, we have shown that pharyngeal collapse is relatively prevalent (Bearpark et al. 1995; Ohayon et al. 1997; Young et al. 1993), that it is heritable (Davies et al. 1996; Silverberg et al. 1997) and that vulnerability varies in both human and animal populations (Gau et al. 1995; Guthrie et al. 1980; Hui et al. 1999; Redline et al. 2002). We have also shown that the sequelae associated with pharyngeal collapse may well lower reproductive success by decreasing health and lowering life expectancy (Shin et al. 2003). Despite the possibility that the symptoms strongly associated with pharyngeal collapse, including hypoxia, hypoxemia, cluster headaches, somnolence, fetal abnormality, brain damage and death, created evolutionary disadvantages for our phylogenetic ancestors, the causal, physiological structures remain prevalent throughout present day human and mammalian populations. We have attempted to explain this anomaly and satisfy the last criterion proposed by Williams and Nesse by hypothesizing that certain homeostatic properties that arise with collapse provide adaptive benefits that outweigh the associated sequelae. Pharyngeal collapse very appropriately arises exclusively during sleep, a period that renders many animals vulnerable to heat loss. By decreasing the distance between pharyngeal walls the constriction of the pharynx allows for more intermolecular collisions within inspired air. These collisions should help to warm and humidify inspired air before it reaches the alveoli, reproducing the benefits afforded to mammals by reflex bronchoconstriction. We have also discussed how pharyngeal collapse may enable increased circulation and warmth within the thoracic cavity by inducing increased muscular activity and by creating mechanical stimulation. We have also mentioned that methods of surgical intervention have proven that pharyngeal obstruction and the sleep related disorders that accompany it can be effectively ameliorated by the reduction of certain fleshy structures near the pharynx. The reduction of these structures poses no threat to patients and thus it is not clear what function their excessive size may serve besides those proposed by the present article. The relative degree of hypotonicity of the pharyngeal musculature as well as the relative size of the soft palate, the uvula, and the pharyngeal walls may well be protective and, in modern times, vestigial. The concept of evolutionary medicine has become an increasingly emergent theme in medical science and it has profoundly influenced the viewpoints assumed by immunologists and pathologists. It has become widely accepted that certain forms of disease can be precipitated by specific physiological or immunological adaptations, which arise to combat more pernicious diseases. For example, sickle cell anemia is an unfortunate complication of an evolutionary response to malaria just as cystic fibrosis is a similar response to cholera. Individuals that have a moderate genetic propensity for such adaptive responses are able to successfully combat the specific disease. However, those that have a strong genetic propensity (often characterized by homozygosity) for such a response can experience unfortunate, debilitating complications. In this light, it is interesting to note that the propensity for habitual snoring and OSAS is heritable (Silverberg et al. 1997), with severe complications associated with combined maternal and paternal proclivity (Redline et al. 2002). Researcher John Remmers (2001) finds it "puzzling" that autonomic pharyngeal dilation, an "essential reflex", is reduced or lost during sleep. If pharyngeal collapse had no associated benefit, would not evolution have selected those mammals with more robust pharyngeal musculature and smaller obstructive pharyngeal structures? Would not natural selection have responded to the disadvantages by excising the genotypic expressions of these structures as precisely and effectively as present day otolaryngological surgeons do of their phenotypic counterparts? The hypothesis promulgated by this article cannot be adequately substantiated because of the dearth of related research. As such, like most discussions related to macroevolution, this article has resorted to inferring process from pattern. It is evident that much more work is needed to define the parameters of the influence of pharyngeal collapse on homeostasis. If airway collapse does influence out-of-doors nocturnal respiration, then there should be disease states secondary to its absence. Carefully designed studies that compare the internal and alveolar temperatures in collapse prone animals with those of collapse resistant animals must be performed. Definitive knowledge of the effects of pharyngeal collapse should prove useful for medical science. If collapse really does confer a significant homeostatic benefit then it will be essential for physicians to counsel their uvulopalatopharyngoplasty patients accordingly. Anuntaseree W, Rookkapan K, Kuasirikul S, et al. (2001). Snoring and obstructive sleep apnea in Thai school-age children: prevalence and predisposing factors. Pediatr Pulmonol. 32:222-227. Awe R, Nicotra M, and T Newsom. (1979). Arterial oxygenation and alveolar-arterial gradients in term pregnancy. Obstet Gynecol. 53:182-186. Barbet JP, Chauveau M, Labbe S, et al. (1988). Breathing dry air causes acute epithelial damage and inflammation of the guinea pig trachea. J Appl Physiol. 64:1851-1857. Bearpark H, Elliott L, Grunstein R, et al. (1995). Snoring and sleep apnea: a population study in Australian men. Am J Respir Crit Care Med. 151:1459-1465. Brouillette R, Fernbach S, and C Hunt. (1982). Obstructive sleep apnea in infants and children. J Pediatr. 100(1):31-40. Brownell L, P West, and M Kryger. (1986). Breathing during sleep in normal pregnant women. AM Rev Respir Dis. 133:38-41. Cirignotta F, D'Alessandro R, Partinen M, et al. (1989). Prevalence of every night snoring and obstructive sleep apnoeas among 3069-year-old men in Bologna, Italy. Acta Neurol Scand. 79:366-372. Cole P. (1954). Recordings of respiratory air temperature. J Laryngol Otol. 68:295-307. Corbo GM, Fuciarelli F, Foresi A, et al. (1989). Snoring in children: association with respiratory symptoms and passive smoking. BMJ. 299:1491-1494. Crumley RL, Stein M, Gamsu G, et al. (1987). Determination of obstructive sleep apnea. Am J Roentgenol. 148:1069-1074. Davies R and J Stradling. (1996). The epidemiology of sleep apnea. Thorax. 51(suppl 2):S65-S70. Deegan P and W McNichols. (1995). Pathophysiology of obstructive sleep apnoea. Eur Respir J. 8(7):1161-78. Doyle WJ, Skoner D, Seroky J, et al. (1994). Effect of experimental rhinovirus 39 on the nasal response to histamine and cold air challenges in allergic and nonallergic subjects. J Allergy Clin Immunol. 93:534-42. Eagan CJ. (1963). Local vascular adaptations to cold in man. Federation Proc. 22:947-951. Ferrus L, Guenard H, Vardon G, et al. (1980). Respiratory water loss. Respir Physiol. 39:367-381. Fitzpatrick M, Martin K, Fossey E, et al. (1993). Snoring, asthma and sleep disturbance in Britain: a community-based survey. Eur Respir J. 6:531-535. Gau S and W Soong. (1995). Sleep problems of junior high school students in Taipei. Sleep. 18:667-673. Geller D, Morgan W, Cota K, et al. (1988). Airway responsiveness to cold, dry air in normal infants. Pediatr Pulmonol. 4:90-97. Gombosi T. (1994). Gaskinetic Theory. Cambridge, Cambridge University Press. Guthrie R, Standaert T, Hodson W, et al. (1980). Sleep and maturation of eucapnic ventilation and CO2 sensitivity in the premature primate. J Appl Physiol. 48:347-354. Hastie S, Prowse K, Perks W, et al. (1989). Obstructive sleep apnoea during pregnancy requiring tracheostomy. Aust. NZ J Obstet Gynaecol. 3:365-367. Henke K, Dempsey J, Badr M, et al. (1991). Effect of sleep-induced increases in upper airway resistance on respiratory muscle activity. J Appl Physiol. 70:158-168. Hertz G, Fast A, Feinsilver S, et al. (1992). Sleep in normal late pregnancy. Sleep. 15:246-51. Heym J, Steinfels G, and B Jacobs. (1982). Activity of serotonin containing neurons in the nucleus raphe pallidus of freely moving cats. Brain Res. 251:259-276. Holdcroft A, Bevan D, O'Sullivan E, et al. (1977). Airway closure during pregnancy. Anesthesia. 32:517-523. Horner R, Innes J, Morrell M, et al. (1994). The effect of sleep on reflex genioglossus muscle activation by stimuli of negative airway pressure in humans. J Physiol. (Lond) 476:141-151. Horner R. (1996). Motor control of the pharyngeal musculature and implications for the pathogenesis of obstructive sleep apnea. Sleep. 19:827-853. Hui D, Chan J, Ho A, et al. (1999). Prevalence of snoring and sleep-disordered breathing in a student population. Chest. 116:1530-1536. Iscoe S, Young R, and D Jennings. (1983). Control of respiratory pattern in conscious dog: effects of heat and CO2. J Appl Physiol. 54:623-631. Kapur V, Strohl K, Redline S, et al. (2002). Underdiagnosis of sleep apnea syndrome in US communities. Sleep. 6:49-54. Krespi Y, Keidar A, Khosh M, et al. (1994). The efficacy of laser-assisted uvulopalatoplasty in the management of obstructive sleep apnea and upper airway resistance syndrome. Otolaryngol Head Neck Surg. 6:235-243. Kubin L, Tojima H, Reignier C, et al. (1996). Interaction of serotonergic excitatory drive to hypoglossal motoneurons with carbachol-induced, REM sleep-like atonia. Sleep. 19:187-195. Lavie P, Lavie L, and A Perelman. (2001). Plasma Homocysteine Levels in Obstructive Sleep Apnea: Association With Cardiovascular Morbidity. Chest. 120:900-908. Lefcourt L and J Rodis. (1996). Obstructive sleep apnea in pregnancy. Obstet Gynecol Survey. 51:503-506. Liistro G, Stanescu D, Dooms G, et al. (1988). Head position modifies upper airway resistance in men. J Appl Physiol. 64(3):1285-1288. Lloyd E. (1994). ABC of sports medicine: temperature and performace I: cold. BMJ. 309:531-534. Lonergan R, Ware J, Atkinson R, et al. (1998). Sleep apnea in obese miniature pigs. J Appl Physiol. 84(2):531-536. Loube D, Poceta J, Morales M, et al. (1996). Self-reported snoring in pregnancy. Association with fetal outcome. Chest. 109:885-889. Lugaresi E, Cirignotta F, Coccagna G, et al. (1980). Some epidemiological data on snoring and cardiocirculatory disturbances. Sleep. 3:221-224. Maasilta P, Bachour A, Terama K, et al. (2001). Sleep-related disordered breathing during pregnancy in obese women. Chest. 120:1448-1454. Mc Fadden J. (1983). Respiratory heat and water exchange: physiological and clinical implications. J Appl Physiol: Respirat Environ Exercise Physiol. 54(2):331-336. Mc Fadden J, Denison D, Waller J, et al. (1982). Direct recordings of the temperatures in the tracheobronchial tree in normal man. J Clin Invest. 69:700-705. Millar J, Nairn J, Unkles R, et al. (1965). Cold air and ventilatory function. Br J Dis Chest. 59:23-27. Milsom W, Castellini M, Harris M, et al. (1996). Effects of hypoxia and hypercapnia on patterns of sleep-associated apnea in elephant seal pups. Am J Physiol Regulatory Integrative Comp Physiol. 271:R1017-1024. Morin D, Monteau R, and G Hilaire. (1992). Compared effects of serotonin on cervical and hypoglossal inspiratory activities: an in vitro study on the newborn rat. J Physiol. 451:605-629. Nakamura A, Fukuda Y, and T Kuwaki. (2003). Sleep apnea and effect of chemostimulation on breathing instability in mice. J Appl Physiol. 94(2):525-532. Nesse R and G Williams. (1998). Evolution and the origins of disease. Scientific American. 279:58-65. O'Cain C, Dowling N, Slutsky A, et al. (1980). irway effects of respiratory heat loss in normal subjects. J Appl Physiol: Respirat Environ Exercise Physiol. 49:875-880. Ohayon M, Guilleminault C, Priest R, et al. (1997). Snoring and breathing pauses during sleep: telephone interview survey of a United Kingdom population sample. BMJ.314:860863. Petrof B, Pack A, Kelly A, et al. (1994). Pharyngeal myopathy of loaded upper airway in dogs with sleep apnea. J Appl Physiol. 76:1746-1752. Popovic R and D White. (1995). Influence of gender on waking genioglossal electromyogram and upper airway resistance. Am J Respir Crit Care Med. 152:725-31. Powell N, Riley R, Troell R, et al. (1998). Radiofrequency volumetric tissue reduction of the palate in subjects with sleep-disordered breathing. Chest. 133:1163-1174. Profet M. (1995). Protecting Your Baby-To-Be. Reading, Mass, Addison Wesley. Rappai M, Collop N, Stephen K, et al. (2003). The nose and sleep-disordered breathing: what we know and what we do not know. Chest. 124:2309-2323. Redline S and P Tishler. (2000). The genetics of sleep apnea. Sleep Med Rev. 4:583-602. Redline S, Tishler P, Hans M, et al. (1997). Racial differences in sleep-disordered breathing in African-Americans and Caucasians. Am J Respir Crit Care Med. 155:186-192. Remmers J. (2001). Wagging the tongue and guarding the airway: reflex control of the genioglossus. Am J Respir Crit Care Med. 164(11):2013-2014. Powell N, Riley R, Troell R, et al. (1998). Radiofrequency volumetric tissue reduction of the palate in subjects with sleep-disordered breathing. Chest. 113:1163-1174. Rollheim J, Osnes T, and H Miljeteig. (1999). The sites of obstruction in OSA, identified by continuous measurements of airway pressure and flow during sleep: ambulatory vs in-hospital recordings. Clin Otolaryngol. 24:502-506. Serway R. (1990). Physics for Scientists and Engineers with Modern Physics, 3rdEd, Saunders College Publishing. Shepard J. (1985). Gas exchange and hemodynamics during sleep. Med Clin North Am DA. 19851231(6):1243-1264. Shin C, Joo S, Kim J, et al. (2003). Prevalence and Correlates of Habitual Snoring in High School Students. Chest. 124:1709-1715. Shnider S and G Levinson. (1977). Anesthesia for obstetrics. In: Miller RD, ed. Anesthesia. 32:517-523. Siegel J. (1999). The evolution of REM sleep. In Handbook of Behavioral State Control., Lydic R and Baghdoyan eds., pp 87-100, CRC Press, Boca Raton. Silverberg D and A Oksenberg. (1997). Essential hypertension and abnormal upper airway resistance during sleep. Sleep. 20:794-806. Teran-Santos J, Jimenez-Gomez A, and J Cordero-Guevara. (1999). The association between sleep apnea and the risk of traffic accidents. NEJM. 340:847-851. Thomason J and A Russell. (1986). Mechanical factors in the evolution of the mammalian secondary palate: a theoretical analysis. Morphol. 189(2):199-213. Togias A, Naclerio R, Peters S, et al. (1986). Local generation of sulfidopeptide leukotrienes upon nasal provocation with cold, dry air. Am Rev Respir Dis. 133:1133-1137. Utley D, Shin E, Clerck A, et al. (1997). A cost-effective and rational surgical approach to patients with snoring, upper airway resistance syndrome, or obstructive sleep apnea syndrome. Laryngoscope. 107:726-734. Veasey S, Fenik P, Panckeri K, et al. (1999). The Effects of Trazodone with L-Tryptophan on Sleep-disordered Breathing in the English Bulldog. Am J Respir Crit Care Med. 160(5):1659-1667. Wark K and D Richards. (1999). Thermodynamics, 6th Ed., McGraw-Hill. Wiegand L, Zwillich C, Wiegand D, et al. (1991). Changes in upper airway muscle activation and ventilation during phasic REM sleep in normal men. J Appl Physiol. 71:488-497. Williams G and R Nesse. (1991). The Dawn of Darwinian Medicine. The Quarterly Review of Biology. 66:1-22. Young T, Evans L, Finn L, et al. (1997). Estimation of the clinically diagnosed proportion of sleep apnea syndrome in middle-aged men and women. Sleep. 20:705-706. Young T, Palta M, Dempsey J, et al. (1993). The occurrence of sleep-disordered breathing among middle-aged adults. NEJM. 32:1230-1235. Young T, Peppard P, Palta M, et al. (1997). Population-based study of sleep-disordered breathing as a risk factor for hypertension. Arch Intern Med. 157:1746-1752. Zielinski J, Zgierska A, Polakowska M, et al. (1999). Snoring and excessive daytime somnolence among Polish middle-aged adults. Eur Respir J. 14:946-950.